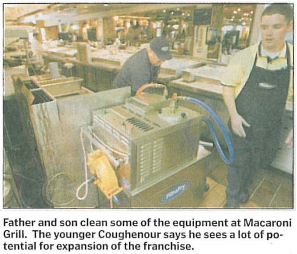 Franchise fills a unique need by cleaning restaurants’ deep fryers, prolonging use of used oil. Roger Coughenour quit a job that paid almost $80,000 a year, put a second mortgage on his house, cashed out his 401(k) retirement account and borrowed money from family members to start a local franchise of a business many didn’t even know existed. For a while he wondered if he was crazy. In January, Coughenour, his wife, Casey, and father, Roger Sr., started up a local franchise of FiltaFry, a business specializing in mobile cleaning of deep fryers and fryer-oil recycling. The business, which now services about 30 commercial customers – mostly restaurants with some hospitals and cafeterias – is growing; there are plans to add a second van soon. But Coughenour Jr., 31, said he still gets blank expressions when pitching his business to potential clients. He said at first most people think he is selling a deep fryer or a filter instead of servicing their existing equipment. Unlike other business ventures, FiltaFry does not dispose of commercial kitchens’ used cooking oils. FiltaFry was founded in England in 1996 and has more than 100 U.S. franchises in 37 states. The company vacuum cleans and scrubs deep fryers and uses a micro-filtration system to extend the life of cooking oils. Testing and calibrating of fryer thermostats is also included in the service. He said most commercial kitchens just wait until cooking oil turns black and starts to smell before changing the oil in their deep fryers. Londa Anderson, the manager of Wood’ys Grill and Bar on Truxtun Extension, said the service cuts down on fryer maintenance and has doubled the life of the restaurant’s oil without a noticeable difference in the taste of its food. She said the service saves Wood’ys at least $400 a month in reduced oil purchases and oil pickup expenses and less salaries paid to cooks to clean fryers after closing time. Anderson said the savings includes paying off the $80 a week Woody’s pays to have it’s three fryers serviced. Coughenour said most of FiltaFry’s local clients are serviced once a week and pay an average of $50 a visit for two fryers. He said most clients save at least enough by using FiltaFry to pay for the service, which he said doubles the life of most clients’ cooking oils. But he said the concessions area and kitchen at Rabobank Arena, Theater and Convention Center now discards its oil after about every 20 events, instead of every two events like it did before signing up for the service. He said the business is bringing in about $7,000 a month in sales, enough for him to make a living after he finishes paying off initial start-up costs of about $7,500. But Coughenour expects his business, which owns Kern County franchise rights, to grow exponentially, adding vans and eventually getting national accounts through FiltaFry.